Deja Vu – ghosts, imprints on walls, shapes on the air? Why do we experience that feeling of ‘deja vu’? How come we sometimes feel that an old house still bears the imprints of past inhabitants? I’m not talking about ‘ghosts’ or anything specific or corporeal, but what I have called in my latest novel ‘shapes on the air’. The idea for A Shape on the Air had been brewing in my mind for a long time. I had been reading about, and mulling over, the notion of time slip and especially the concept of ‘worm-holes’ and the Einstein-Bridge theory of portals into other dimensions of time and space, in effect quantum mechanics. It sounds fanciful and Dr Who-ish, and oddly I’m not a great fan of fantasy, but I felt that this was in fact a more ‘logical’ (in some ways!) and scientific explanation of those everyday glimmers of ‘déjà vu’ and perceptions of the past that many of us experience, those intimations that maybe the spirits of history are embedded in the fabric of old houses and ancient geology. So, what if we could take it further and, somehow, actually slip into the world of the past, another world but one to which we might have a personal connection, through our own family links perhaps, which still reverberate through us; some kind of glimpse of shapes on the air. Could, perhaps, our ancestors somehow reach out across time to ‘touch’ us in this world, not physically but spiritually or emotionally? Watching programmes like ‘Who do you think you are’ where the subjects research their ancestral history, I feel that there is a lot more in their discoveries than merely drawing up a family tree and timeline. They often find a rather eerie connection with their family members, in terms of character, situation, talents, life-views and professions. Of course, many of us, myself included, have looked into our family histories and see nothing at all in common with our ancestors, indeed sometimes they seem totally remote! The theory of worm-holes and portals through which we could slip across the time-space continuum into other historic periods and places is really only that – a theory. It’s unproven – how could it be otherwise? But it does raise some wonderfully intriguing ideas. Such a gift for a creative writer. And since it is presented by great scientific minds such as Einstein’s, it lends itself to some serious thought. 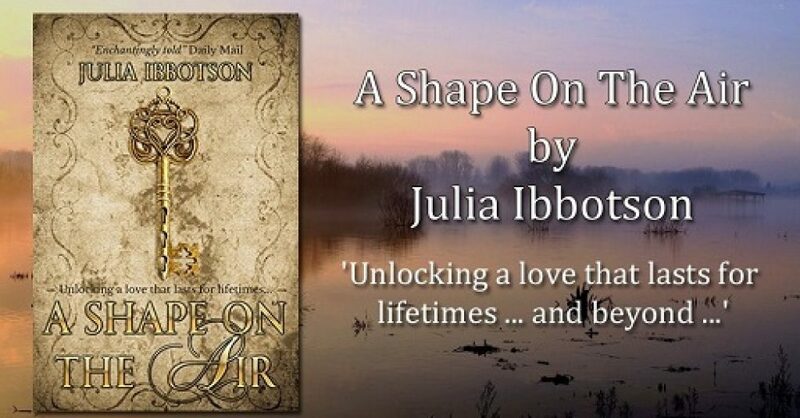 This entry was posted in A Shape on the Air, Books, medieval, new love, parallel universe, romance, the Dark Ages, time-slip by juliaibbotson. Bookmark the permalink. It is an intriguing premise. Who knows what they’ll discover 100 years from now. For now, it does make for good fiction! Thanks for dropping by, Cryssa. Yes, it’s intriguing, isn’t it? I love these time dimension theories!